Your support of the Free Clinic of Culpeper helps provide free medical care to citizens of Culpeper who do not have health insurance or the means to pay for healthcare. There are many ways to provide support. Our thanks to everyone who supports our annual fall Oyster Fest! Your contribution helps provide free medical care to citizens of Culpeper who do not have health insurance or the means to pay for healthcare. The Free Clinic of Culpeper is part of the nonprofit Culpeper Wellness Foundation and provides confidential medical care to those who do not have health insurance or the means to pay for healthcare in Culpeper. The Free Clinic seeks to improve health and promote wellness by providing quality healthcare to eligible adults in Culpeper through a collaboration of community resources. The Clinic is located on the Culpeper Medical Center campus where Novant Health UVA Health System provides access to lab work, imaging and specialty services as needed by our patients. 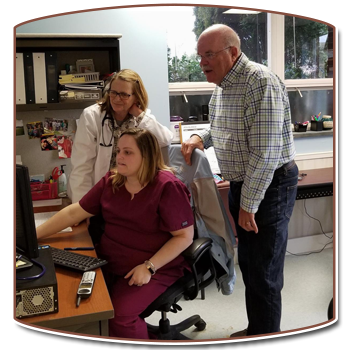 A staff of paid medical and administrative professionals is augmented by community volunteers including physicians, physician assistants, nurse practitioners, nurses, pharmacists and office staff. We are able to provide many medications for free through programs that include The Pharmacy Connection, RxPartnerships, Direct Relief, and Americares. To support overall health and quality of life for our patients, the Free Clinic may refer patients to counseling, transportation assistance, Culpeper Human Services, literacy training, nutrition counseling, employment training, or other services available from local partner organizations. Volunteers are always needed. For more information, call 540-829-5032 or email cmiller@culpeperwellness.org. The Clinic will host eligibility screenings, an informational session, and short tours on March 13 from 1:00 – 2:00 pm. According to the most recent figures, 1,275 newly eligible Culpeper residents have signed up for Medicaid since Jan. 1, with many receiving health insurance for the first time in many years, per the expansion approved last year by the Virginia General Assembly. A conversation with Foundation president Shari Landry and Free Clinic of Culpeper director Chris Miller, published in the Culpeper Chamber of Commerce 2019 Community Guide & Business Directory.